It seems that carbon cranks are all the rage for the new season, with versions from Shimano, Zipp and Easton. Easton?s EC90 continues to use the CNT material and manufacturing technologies that have been the core of its highly regarded carbon product range, but new techniques have enabled the company to strike the perfect balance between weight, strength and performance. Like Shimano, Easton has opted for a steel axle, oversized for maximum stiffness, while keeping the weight down to an impressive 570g (665g complete with BB). Hollow crank arms are a major part of the weight saving, and a significant step forward from wrapping carbon over an aluminium core. For stiffness, the hollow arms have a larger cross-section, made possible by new manufacturing techniques. 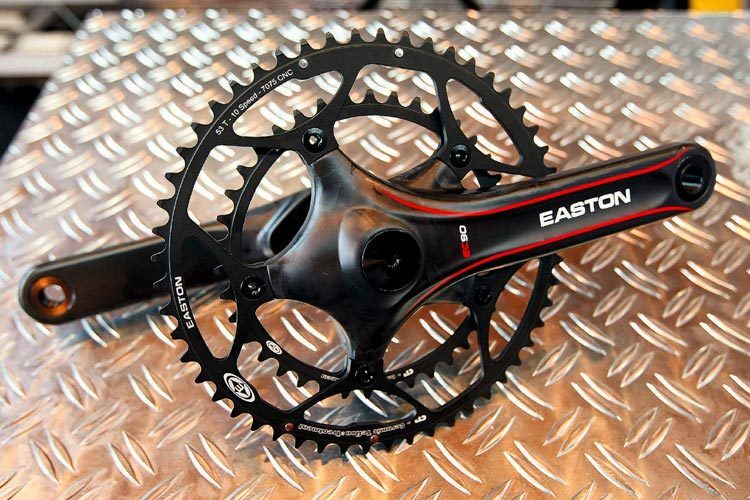 Such intense focus on the crank arm design may explain why Easton has borrowed Stronglite?s CT2 ceramic and Teflon-treated rings, instead of producing its own. EC90 CNT cranks will be available as standard 53/39 initially, with crank lengths 170, 172.5 and 175mm, but contain your excitement for now ? they won?t hit the market until spring ?08. The price is still to be decided.